Following the recent multi-million pound merger between Bellpenny & Ascot Lloyd, the newly merged financial services company decided to rebrand. The result of this meant that the company dropped the name Bellpenny and are known simply as Ascot Lloyd. 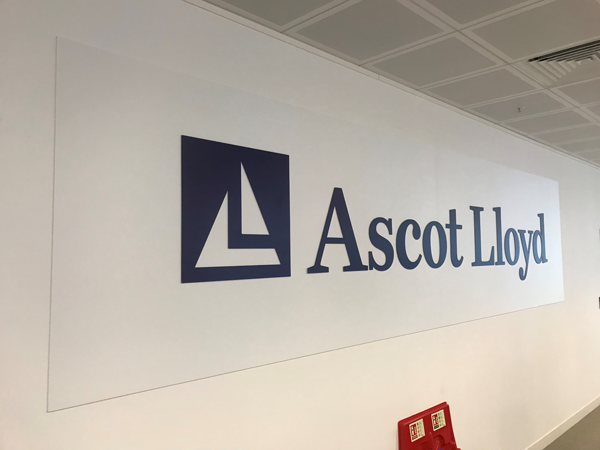 The Color Company were tasked with re-branding Ascot Lloyd’s signage & window graphics for their UK offices. The project was a multi-site installation roll out across various locations and was carried out over an 8 week period. In order to comply with the client’s regulatory requirements, it was important that the installations were carried within a strictly defined timescale. The project consisted of various signage made from profile cut printed acrylic for their internal offices and printed dibond wayfinding signage for external use in car parks. 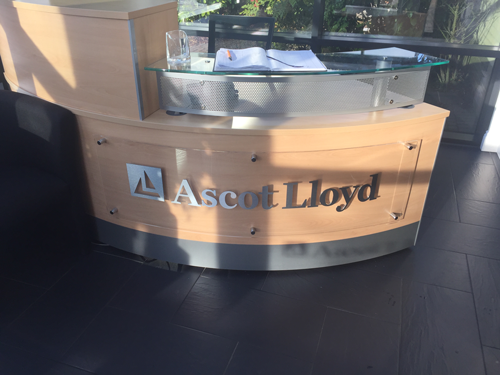 To make an impact we also produced large profile cut lettering that spelled out the Ascot Lloyd name and logo, there were 2 variations of this. The internal main offices had a printed version done in Ascot Lloyd’s corporate blue colour and for the reception areas, there was a stylish brushed aluminium effect. The majority of the project involved producing over 100 sq.m of frosted cut vinyl. This acted as a privacy screen and also as a means to emphasise the Ascot Lloyd brand. The installation was expertly carried out by our trained installers who had the added challenge of having to firstly remove the stubborn old frosting that had been in place for quite a while. As part of Health & Safety requirement, clear windows need to have some kind of frosting on them, unfortunately a lot of this is rather uninspiring with the usual repeating circles or cube patterns. 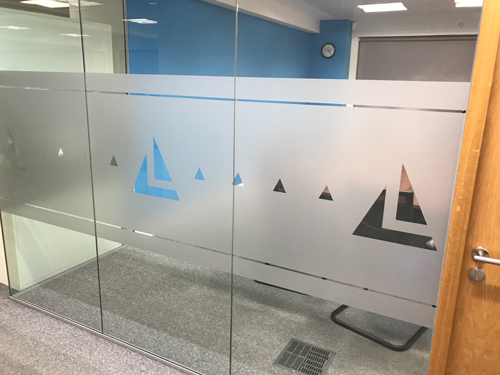 The frosting effect achieved at Ascot Lloyd’s offices is an excellent example of clever branding that can be done with frosted cut vinyl. Website quote: “The Wellcome Image Awards are celebrating their 20th year of bringing us the world’s most incredible science images and to celebrate, the Wellcome Images exhibition will be returning to Millennium Point this March! Showcasing the best in science image making, this year’s awards include a broader range of cutting-edge artistic and scientific techniques than ever before. From photography and illustration to super-resolution microscopy and medical scans, the images use a variety of methods to capture the imagination and bring complex concepts to life”. The Color Company worked closely with Birmingham’s Westside Business Improvement District to commemorate war heroes from local areas. This was achieved by the production & installation of Dibond signage along Broad Street in the heart of Birmingham city centre. With such positive feedback in the local area, Westside is looking to make the ‘Walk Of Heroes’ an annual occurrence and expand the number of Heroes to be honoured. When The Color Company were approached to offer sponsorship to the charity Museum of Architecture, we couldn’t have been more happy to help. The Color Company sponsored the Well Built: Designing for Health and Wellbeing in Architecture exhibition which ran from 1st Nov 2016 – 29th Nov 2016 in a prestigious South Kensington location. They were able to produce everything the charity needed from the Small Format invitations to the open evening through to Large Format displays & vinyl graphics. 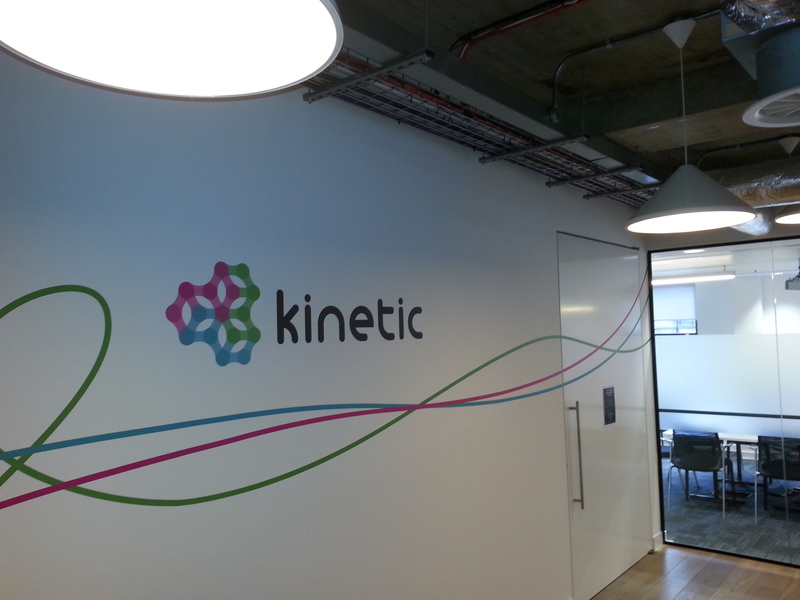 Following a meeting with Kinetic and their rebranding team, we took designer’s initial sketches and were able to quote on production and installation of new graphics following an office move. We won the project against other bids based on previous experience and our relationship with the client, handled by their TCC Account Manager. 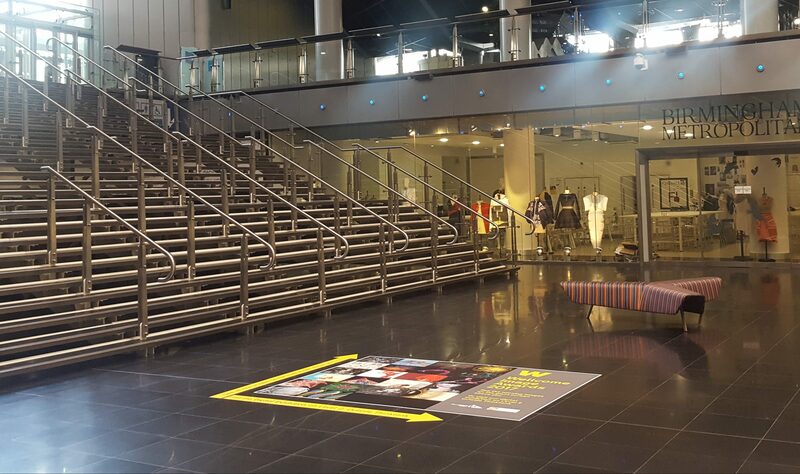 50 linear metres of product was used, taking around 3 days to print, 5 days to install and included removal of the existing graphics. 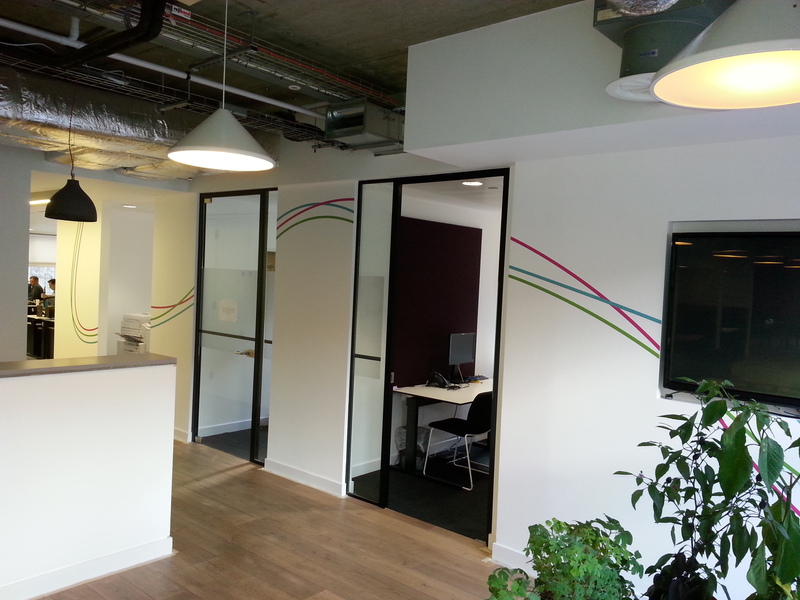 The result was graphics covering 2 floors of offices, corridors, walls and ceilings, plus a happy client!